I’m trying to drink a lot more water. I’m still dealing with cravings for something flavored. Infused Water is the perfect compromise between my health goals and my cravings. Wahoo! This is my recent flavor creation: Orange-Mint Infused Water. My plan is to make a batch every night so my morning water has lots of flavor and replace every night before I go to bed. I plan to try lots of combos! 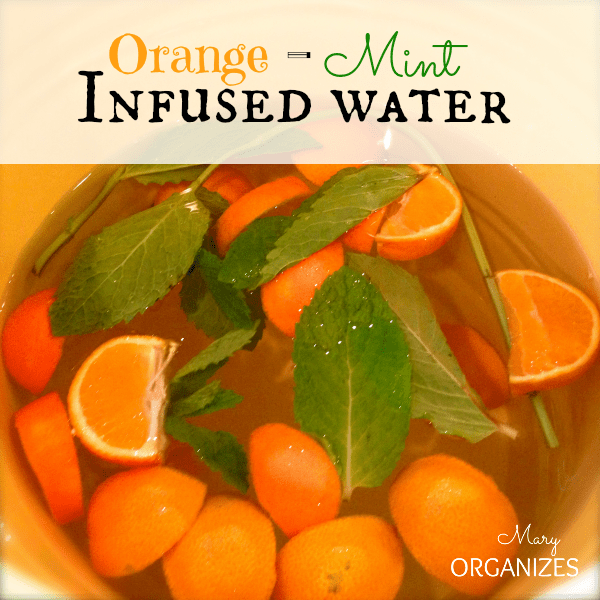 Water improved with a delicious infused flavor of orange and mint. Wash oranges with soap and water in the sink, then slice. Rinse Mint leaves in water. Place sliced oranges and mint in the bottom of the pitcher and cover with plenty of water. The longer the fruit sits in the water, the richer the flavor. Refill water and re-use same oranges and mint. *The pitcher needs to be cleaned and produce replaced approximately once every 1-2 days. Can you get an easier or healthier drink?! I mixed up a big batch for our 4th of July guests last week. Even the kids seem to prefer it, possibly because it was fancier. Little girls sometimes like things just for the simple fact they’re fancier. Sounds. good . i have a lot!! of orange citrus mint growing. how. many. leaves ? do u put. in this. infused water ? from. donnawhiteking@gmail.com.